If you have lost all your teeth, unsecured, traditional dentures are a solution which in many cases has limited success. At times painful, inconvenient and instable, such dentures can make chewing foods difficult, which could stop you from eating many of the foods you once enjoyed. However, modern dentistry has solutions to suit a variety of needs. The All-on-4 treatment option is one such solution. A cost effective solution. Your new replacement teeth require only four implants for each jaw. With fewer implants required, the cost is lowered. Flexible options. You can choose a final prosthetic solution that is best for you, such as a fixed option (one with highest durability and chewing function, but cannot be removed) or a removable option (can be removed by you for easy cleaning). Scientifically proven and documented. All-on-4 is supported by good clinical outcomes from studies in which four implants have been inserted to support a full replacement arch. The tilting of implants has been used in clinical practice for over a decade with favorable results. High stability with only four implants. 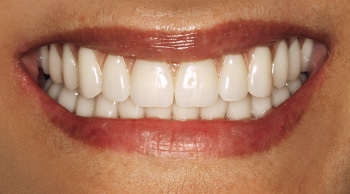 You have a choice between a fixed or a removable final replacement arch. 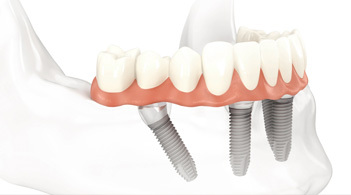 This special implant, anchored at an angle, offers improved support and stability for your replacement arch. When a patient's dentition is beyond simple crowns and bridges, there is a need for a more predictable and long lasting treatment. The denture on this patient is attached to the implants and is extremely stable and allowing the patient to eat and speak like normal.
" I am so happy I chose this treatment, the teeth feel so comfortable and I can eat and speak like I did with my natural teeth and I am confident to smile again!"